So yesterday I had the stressful time of unloading the last of the stuff from my childhood home. I took Tom Rowen with me to hold my hand. It wasn't too bad, actually, as the house looks so dang different now. The new owners (who haven't actually closed yet) have been redoing the floors and have a lot of furniture moved in (which irked my dad to no end). So because we only had two truckloads of stuff to move, we were done in about an hour. And I made Tom take me to lunch. Unfortunately we couldn't go to get submarines because the dang sub shop in Metuchen is closed at 3pm (??). Anyway, when we discovered that we had to turn around to go back into town for burgers and we saw this bumper sticker on the back of a pickup truck. And, apparently like the vast majority of the Internet, it confuses me to no end. 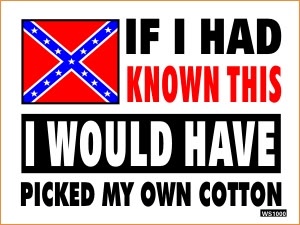 I'm sure it doesn't mean what it says -- "If I had known the Civil War would have happened I would have picked my own cotton." The Internet seems confused too. Scoot down this blog post. He has no idea either. I expect it's something more like "If I'd know we'd have a black President(? )/unspecified problems which I arbitrarily blame on black people/something else I would have picked my own cotton." I... I simply can't figure it out. UPDATE: oh, apparently the original,from which this is minced, read (more clearly and racist): "if I'd known they were going to be this much of a problem, I'd of picked my own cotton." Well yes, you're right of course. How About a Popular Language Like Dutch?